Dad had a phrase he used when he saw someone do something particularly skillful. It might be a man keeping 20 plates spinning on sticks on the Ed Sullivan show, the logger sports at the fall fair or the RCMP Musical Ride. He would smile his gentle smile, shake his head and say "Watch out for someone who makes something look easy." When a friend would comment on something mom had made, a cake she had baked and decorated, a garment she had sewn, a sweater she had knitted, he would draw himself upright and say, with just a tinge of pride, "My wife built it." Dad died the same month I started weaving. He didn't live long enough to see my brother Don grow into a successful man, turning his childhood dreams into reality. He didn't see me turn weaving into my career, my passion, my life. He wasn't able to enjoy my travelling around North America, even as far as Europe, Great Britain, Scandinavia several times. He wasn't able to see the publication of Magic in the Water or any of the Big Projects. I hope that if his spirit checks in to this reality from time to time that he will drop by when the latest Big Project goes public, draw himself upright, smile his little smile and say "My daughter built it." From time to time a newbie will declare that they are only ever going to put loooong warps on so that they don't have to warp their loom. Or one will declare that they are going to 'invent' a way to have continuous warps so that they don't have to warp their loom again. Ever. Got news for you. All yarns end. That half pound of cotton? Ends. That pound cone? Ends. That kilo cone? Ends. At some point, everything comes to an end. Not that I'm not saying you shouldn't put long warps on. I do, after all, have a 50 yard long warp on my AVL. And that isn't the longest warp I've ever done. The thing is, if you never get proficient at beginnings, then endings are always going to be traumatic, or stressful, or unpleasant. Rather than avoid them, then, I recommend that people embrace them. Lose your fear of them. Understand that it is a cycle, just like life. Things begin, and they are exciting and wonderful, but they do come to an end at some point. 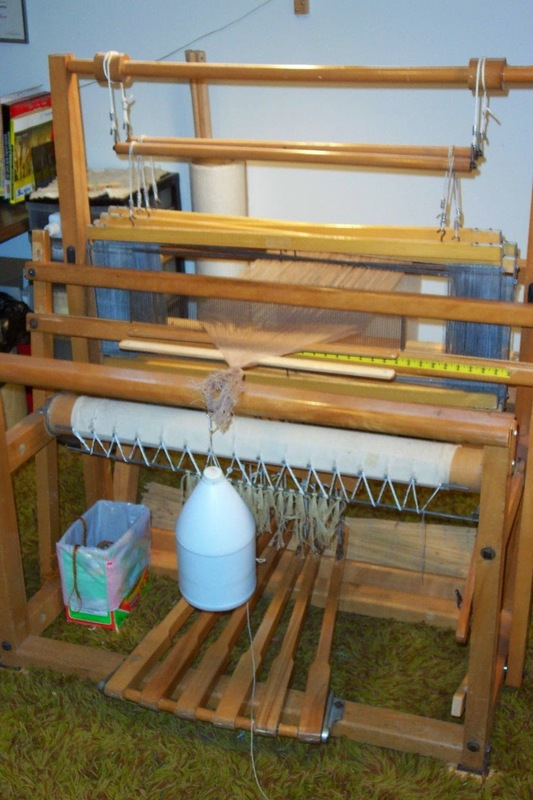 To not want to learn how to dress a loom would be like a knitter professing to never wanting to cast on. For new weavers I recommend putting short warps on, doing as many as you can in as short a time as you can so that you become proficient at it. And then when a warp ends, you won't have separation anxiety. You won't be afraid of the process. 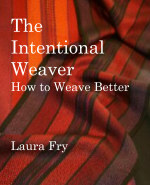 You will look forward to changing the warp - using a different yarn, a different epi, a different weave structure. We no longer need to weave (most of us) to put food on our tables or keep a roof over our heads. We can explore different yarns, different weave structures. Knowing how to efficiently get a new warp beamed gives us the freedom to do different things, create different kinds of cloth. Endings and beginnings are to be celebrated..
After a few uncomfortable days, my back is settling down and I was able to weave for more than a few minutes today. My loom looks very sad with all the things dangling off the back of it, but it's working and that's all that matters. While I always strive for perfection, the fact is that no one and nothing is perfect. Or at least perfection is so rare as to be almost impossible to obtain. We all have battle scars from Life Happening, but we carry on. It is one of the mysteries of life - what's it all about, anyway? That we don't know, truly, why we are here, we just know that we are. We have our dreams and goals and we work towards them as best we are able given our talent and determination and we keep trying. We keep trying in spite of our scars, our imperfections. We carry on, despite our 'disabilities' - our wonky backs, our arthritic hands/feet - or whatever it is that ails us. We forge ahead regardless of the obstacles in our way. In the end - the journey does come to an end, after all - we will be remembered for how well we traveled on our journey, how much we helped others on our way, how much grace we brought with us. In memory of two more local weavers gone on to whatever is next. So much for a nice stretch of purely studio deadlines. Between my mom and both of us, we are having Life Happening. It started with Doug's surgery to fix an annoying problem, then my putting my back 'out'. Mom is having some health issues and between the three of us we are running around with multiple health related appointments. After a nasty couple of days I woke pain free this morning and since I'm supposed to walk more than I sit, decided to try weaving on the AVL. The first session wasn't an unqualified success but after icing it and winding a warp it settled down and I was able to finish the first towel. There are still a couple of bags of yarn on the work table which will have to be put away - once my back is feeling better. Carrying heavy stuff really isn't recommended right now. 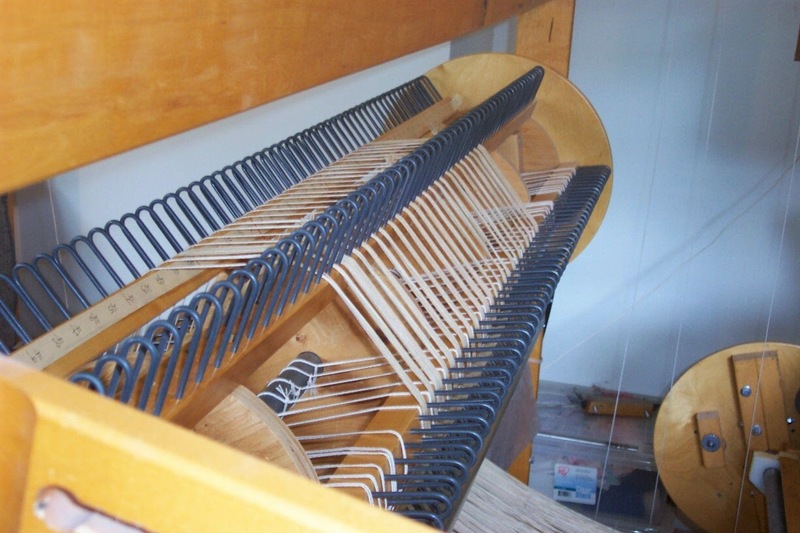 Oh yes - in case you are wondering how I dealt with the missing 6 threads in the warp...you can just see the 6 replacement tubes dangling off the back of the loom. The rod in the ceiling I use for a valet originally began life for just this sort of thing - hanging repair ends. I let them down nearly to the floor, then when they get close to the rod I let them down again. I can weave about 1.5 yards before I need to deal with them, which is just about exactly one session worth of weaving. After a trip to the chiropractor this morning I'm much more mobile, but still feeling 'fragile'. Her advice was to walk more than sit, so I wound warps. I've got all that yarn that needs to be turned into place mats, after all! So once again showing my warp winding 'station'. Tubes on spikes feeding off the ends, winding off the spools counter clockwise (no particular reason, just being as consistent as possible) traveling up through the reed laid flat at the bottom of the board, over head spotlights on to brighten up a somewhat dim part of the studio under the stairs above. So far I've managed two warps, but I'm also waiting for Doug to check the mail and see if the order from Brassard has arrived so that I have the yarn necessary for the warps for the pounds and pounds of yarn shown in a previous post. For now I think I'd better work on the next Craftsy blog posts. Things started fairly well this morning. I read for a while finishing a library book that needs to go back soon, then went to the bank with mom, came home and started on that 50 yard warp on the AVL. My back has been dodgy ever since I fell in March and after the weekend I felt it was a bit 'off' but the soonest I could get in to have an adjustment was Friday. In the meantime I carried on...until I went to get up from the loom. The rest of the day I've been taking muscle relaxants and alternating between hot/cold packs. And hemming. There's lots of that to catch up on! I'm waiting for more 2/8 cotton to arrive so that I can use up most of this yarn. I had enough beige that I was able to wind a 'short' warp (9 meters) which should use up that pale beige beside the blue/green. It's only just one pound. I also offered to transcribe some files, so I will have to fit that into my schedule somewhere. It's looking like my 'leisure' time won't happen any time soon. And that's just fine with me, really. I had a lovely weekend away with my mom visiting with family friends at a 60th wedding anniversary and I'm actually looking forward to some of these 'new' projects lining up for the summer. Amy asked about my multi-stranded weft yarns - how I dealt with them, if I did anything special to make them behave. Three yarn packages set up for winding. I always take off the end of a tube or cone. However, I always have the yarn feed off in the same direction. 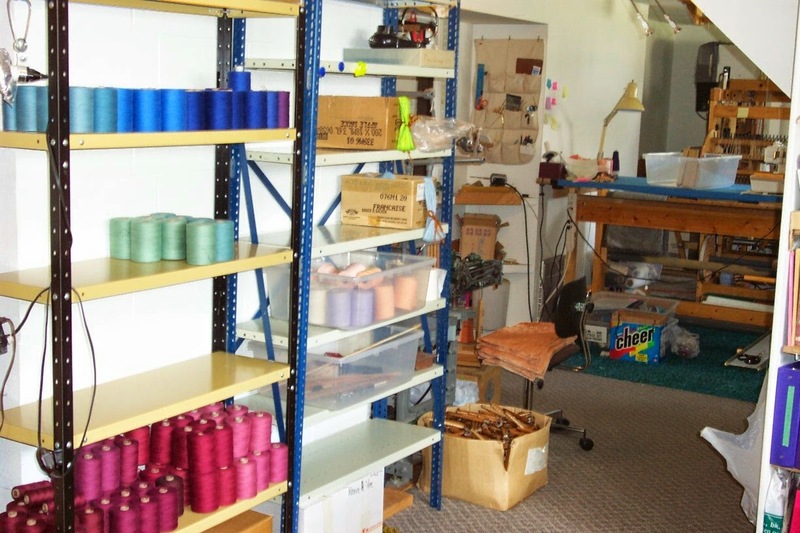 I use an electric bobbin winder which means I have both hands available to control the yarn. My left hand acts as a 'guide', my right hand fills the bobbin. 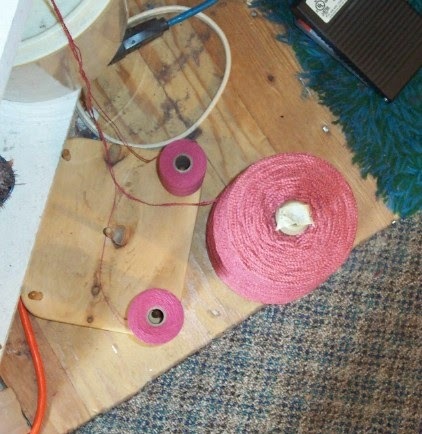 By keeping the yarn feeding up and off the cones/tubes as centered as possible, the yarn feeds off evenly. 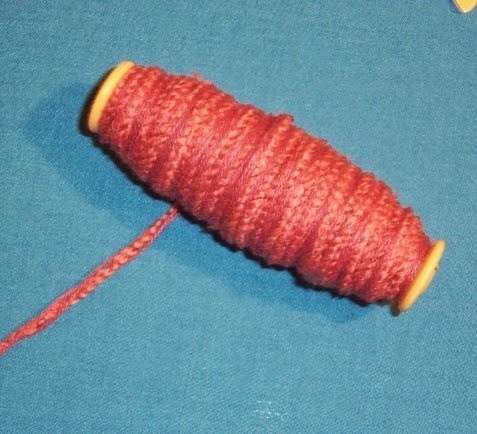 I have tried to use tubes laid on their sides and wound up frustrated with how unevenly they wound off, how the yarn would wrap around the axle holding the tubes, the jerking and uneven pulling of the yarn. Much better results to pull it off the end, imho. Weaving. No, the selvedges aren't perfect but they are as consistent as I can make them. Perfection is for the angels. I'm far from being one of those! 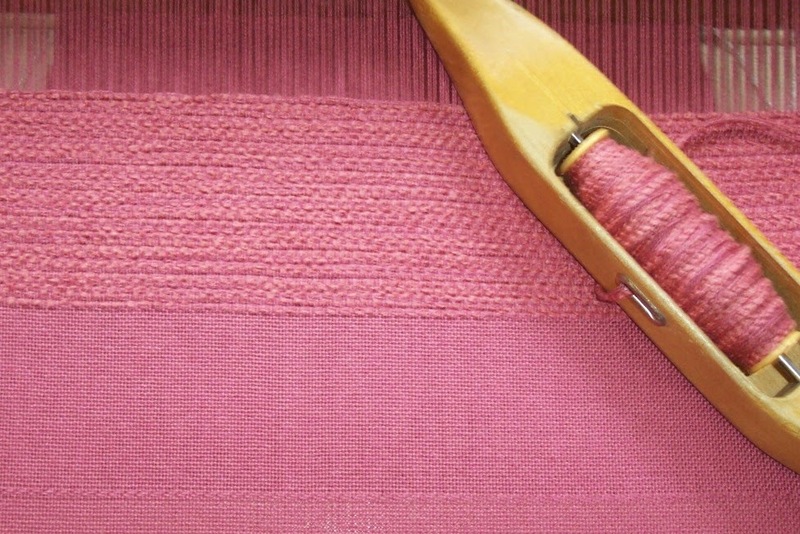 Slight imperfections in terms of yarn length will generally get taken up along the length of the weft pick. If there are large loops at the selvedge, they quite often just get trimmed off. 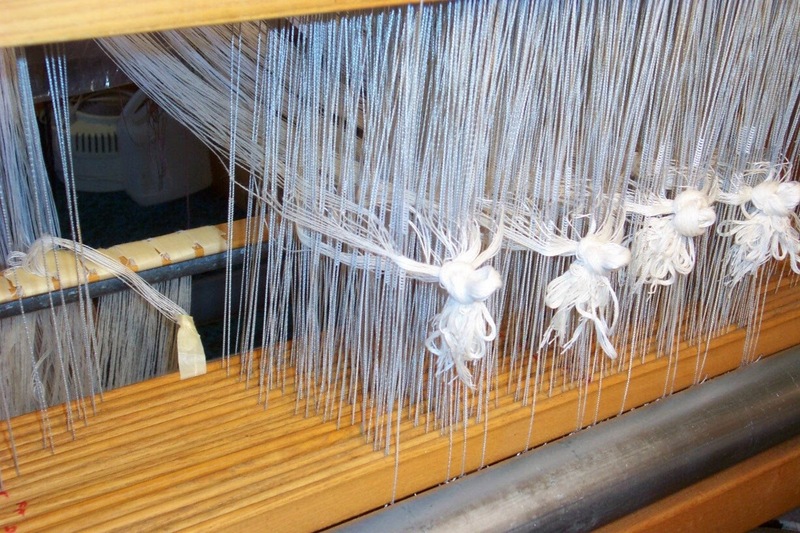 With more than one strand in the weft, cutting one of the yarns isn't going to affect the integrity of the cloth. 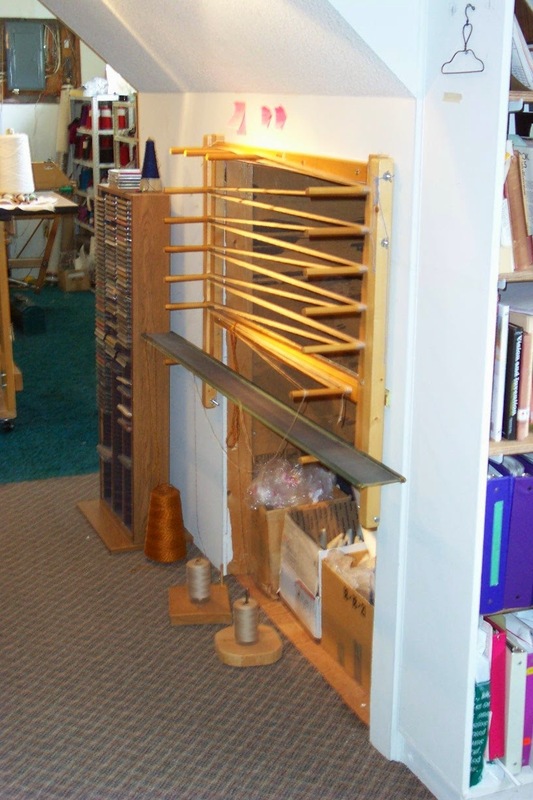 I was on a panel at a conference once and referred to my weaving as mundane - to a chorus of groans from the audience. But I didn't mean that my work was dull; rather I meant that my intention is to make something of and for this world, textiles that I hope will be used every day, not tucked away in a closet for 'special' occasions. There is something rather comforting to return to a tried and true design, one you know is successful in terms of its function, one that you don't have to think about very much, one you can just do. After 18 months of nearly non-stop critical deadlines I am, this week, looking forward to enjoying a little mundane. 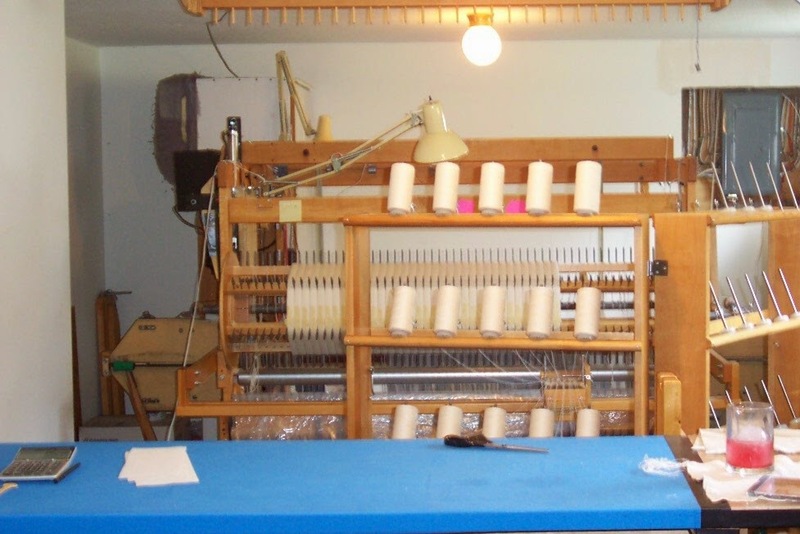 Doug mailed off the samples for the designer and spent much of the weekend winding pirns for the 50 yard warp on the AVL. It will take a few days for the go-ahead from her, though, so in the meantime I am working on another place mat warp. I weighed the several cones of yarn I want to stash bust and one of them is nearly 5 pounds, several at 2+ pounds and several more at one pound each. That's a lot of yarn! But it will be great for place mat weft and since I'm low on inventory of mats, it's a good time to plough through as much of this yarn as I possibly can. The weft is one strand of the stash yarn plus two strands of 2/8 cotton. They are not exactly the same colour which is giving the cloth a nice richness to it. This rose is one of those 2+ pound cones so I expect I can do two 11 meter long warps - and still probably have a little bit left over. 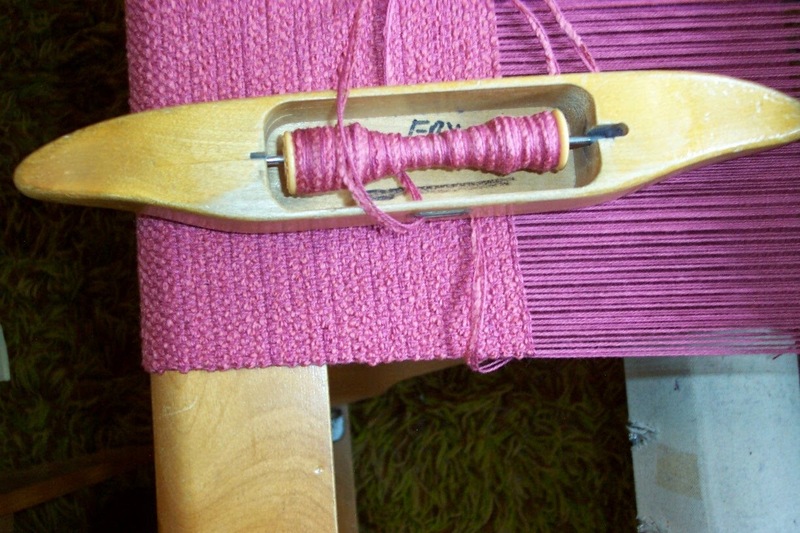 But it is a pretty colour and so far I'm enjoying the weaving. Perfect day for driving. River just two blocks away from the Inn. Looks like it is running high with the spring melt. Guess I'm more or less rested because instead of staying focused on what I am doing - which is threading - I keep thinking about things to do. These things either a) sound like fun or b) seem necessary. So rather than staying in the front of this warp getting it threaded, I have been running up and down the stairs, firing off emails. Then, not too much later, roaring back up to see if anyone has answered my queries. Patient? Can't say that I am! However, by lunch time I was almost at the half way mark. Perhaps it was low blood sugar keeping me from staying on task and I'll do better now that I've eaten? Ya, right! So what does a 50 yard long warp look like? Like this. No, this isn't the longest warp I've ever done. In spite of Life Happening in a mild sort of way, I have managed to get this warp nearly done the beaming part of the process. I think there are 5 more sections to fill. My sectional beam is in 1" sections. Ultimately it means more winding (twice as much as a beam with 2" sections) but it also means I don't have to have as many yarn packages. Since this warp is 32 epi, if I were beaming 2" at a time I would need to have 74 yarn packages. This warp is going to use up 32 epi x 44 sections each 50 yards (plus) long = 70,400 + yards - or about 10 pounds of yarn. 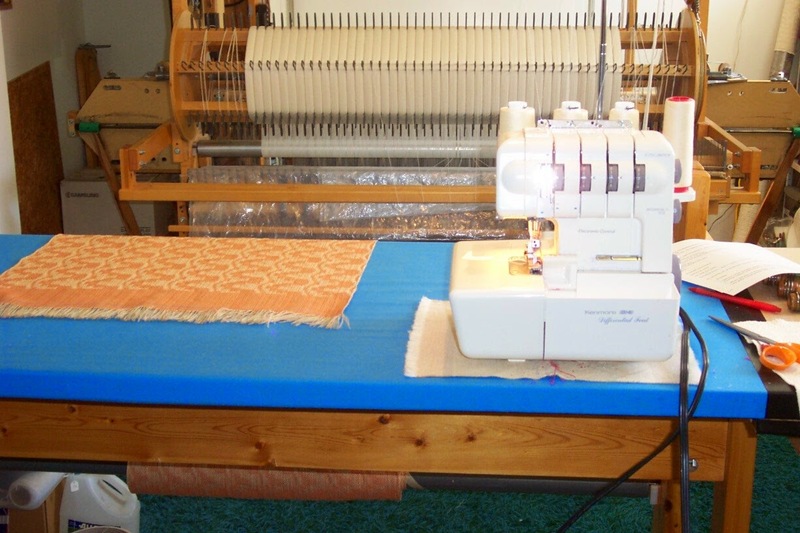 Threading will take about 3-4 hours, then an hour or so to sley and tie the warp to the front apron rod. This afternoon I cut the 30 yard warp off the loom. As soon as I strip the thrums off I will jump all over that 50 yard warp that is next in the queue. Weaving, like life, is full of endings - and beginnings. Warps end. Bobbins run out. We learn how to deal with these endings, usually by beginning something else. 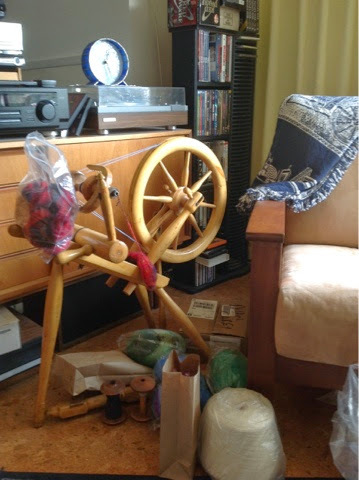 A new bobbin gets overlapped onto the old and weaving continues. Not seamless, but onwards, nevertheless. Threads break. We fix them. And then carry on. Nothing is 'perfect'. We all have our little 'flaws'. Our overlapped weft joins. Our broken ends. But that doesn't stop us. We move on to the next warp, the next bobbin, the next project. We are all 'broken' in some way. According to Leonard Cohen, that's how the light gets in. 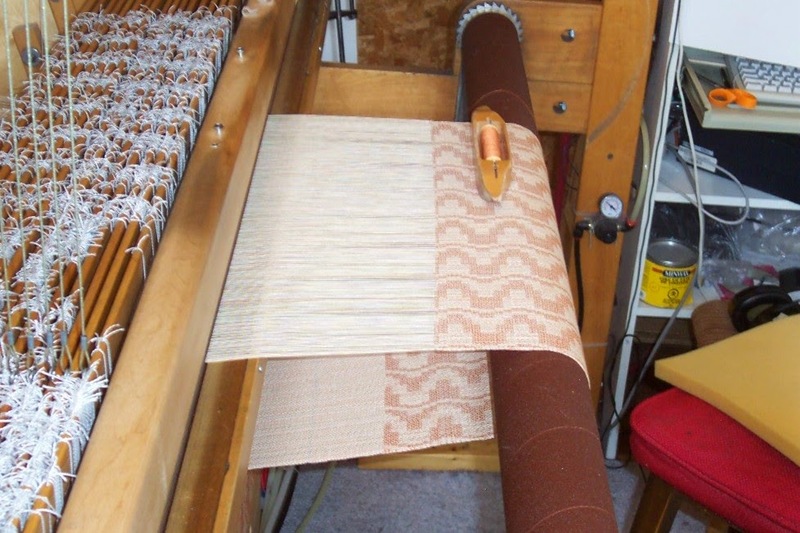 One of the benefits of doing the Big Project is that it left me with a standard place mat warp on the loom. A design that uses up a fair bit of yarn for weft as I bundle several strands together to make a nice thick yarn. Because 'taking it easy' turned out to be not so much not weaving, as simply not thinking. I finally got to the point this morning when the little grey cells began to function again - along about the time I could see the end of the mat warp approaching - and I dragged out my Brassard yarn samples in order to assemble an order of yarn. I had enough rose pink on hand to go with the big cone of rose on the right hand side of the table, but all the rest? Not enough yarn to go with it. 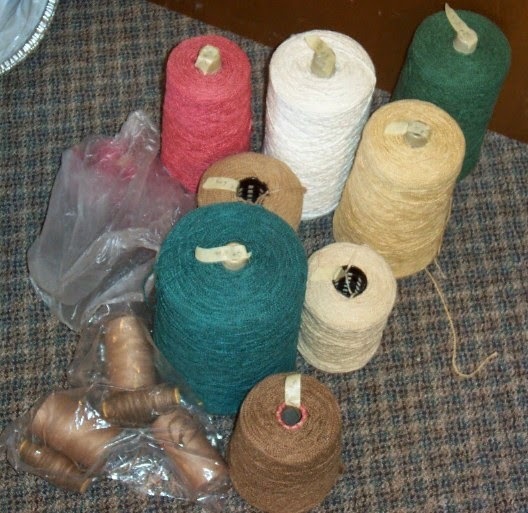 And so I have about a 40 (or more) pound order going in tonight so that I can use up the cones of yarn on my work table. Well, I'm getting some 'extra' because, well, you know...yarn. Once the mat warp is off the Leclerc I will finish the towel warp on the AVL and get the 50 yard warp on, weave colour samples and send to the designer for approval. While that happens, I can go back to the Leclerc and put the rose warp on there, then jump back onto the AVL when the designer approves the colours. In the meantime I have been gradually putting the studio back together. 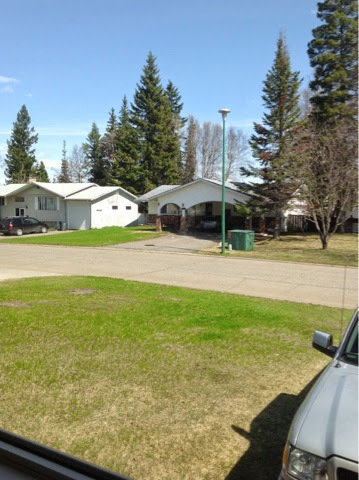 Next stop - my friend's to pick up all the boxes and bins (and the trampoline) stored there. Until then, I'm enjoying the room to move about at one end of the studio! This post is number 1500. Wow. 1500 blog posts since starting this journey in August 2008. Anniversaries and milestones are a time for looking back, to appreciate the road travelled, maybe marvel a little at how far one has come, the obstacles and detours along the way as well as the high points. It's been an incredible journey so far. Yes, there have been dips in the road, places where it all but disappeared, where floods washed it out and bailey bridges needed to be built. Or where the road seemed to go somewhere else entirely, only to come back to the main road. On those occasions, lessons needed to be learned, skill sets improved, before forward progress could begin again. 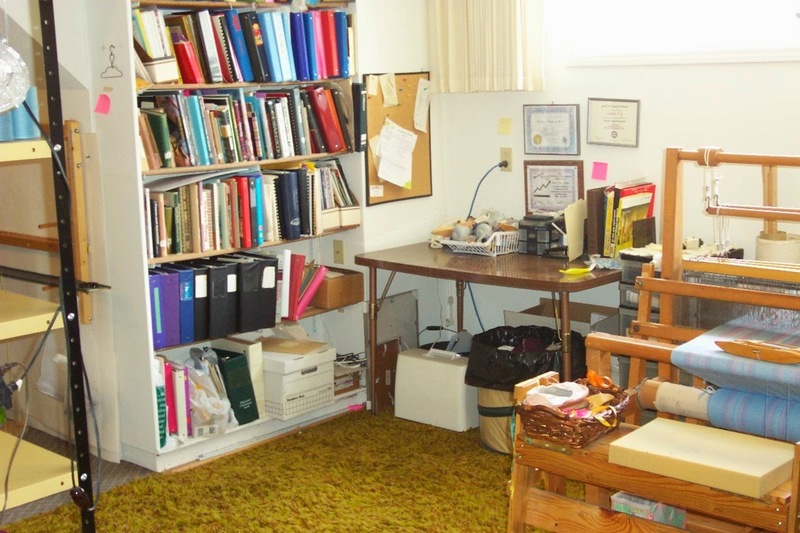 With nearly 40 years of weaving, teaching and writing about weaving under my belt, what's next? I don't know, exactly. What I do know is that I have way too much yarn that will need to be used up. 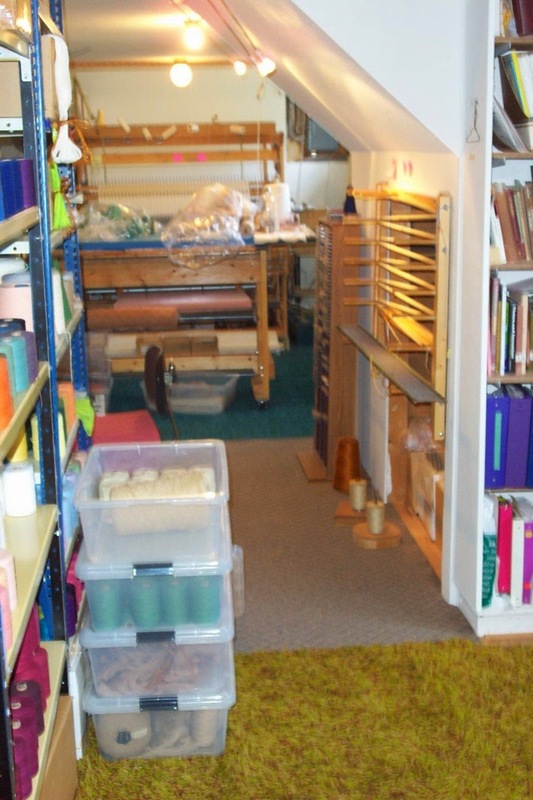 I have a studio full of stuff related to weaving, stuff that I have carefully gathered over the years to make the 'job' of weaving easier for me. I have a love for threads that I want to share with anyone who is interested. The Master program at Olds College. Craftsy blogs. A couple of yet to be announced projects in the works (but not wanting to 'jinx' them, shall remain in the shadows until closer to completion). What I did not foresee was: Writing a book that some people refer to as a 'classic'. Teaching not only in Canada but other countries. Meeting a community of people who are breathtaking in their knowledge, enthusiasm and generosity. Do I have regrets? Yes, some. There are things that I wish I had done differently. But overall? 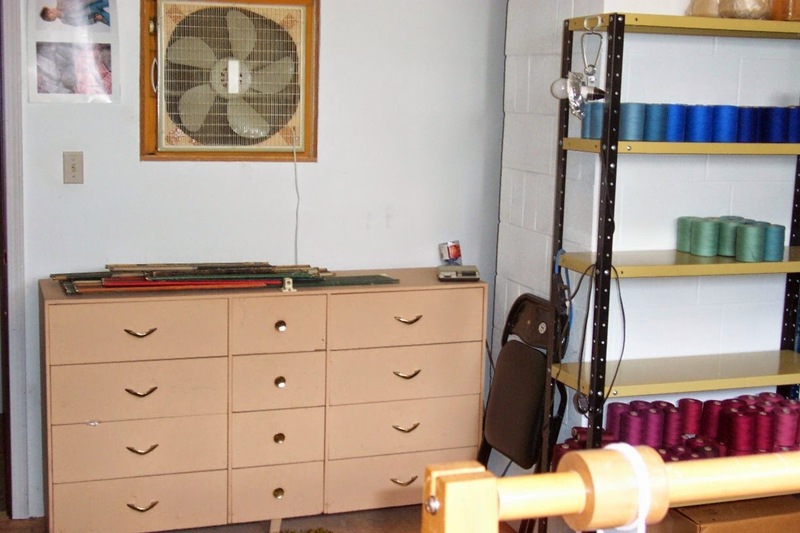 I have no regrets about that fateful day in March of 1975 when I suggested that a person could weave fabric and sell it to make a little money and Doug agreed that sounded like a plan. None. None whatsoever. May 9. For me this date has special significance for several reasons. May 9, 1970 Doug and I got married. May 9, 2008, I had an angioplasty with two stents installed. May 9, 2014 I said goodbye to the 'crew' who is helping bring the latest Big Project into material form. While I am no stranger to Big Projects, I didn't have all of the skills required for this one, so the input of professionals was required. This project had been on my bucket list for, well, decades. To finally see this become reality is satisfying beyond my ability to convey. It isn't perfect. I could have done better. But it's like weaving. Perfection is pretty much impossible, so you just have to settle for the way it is. Hopefully it is good enough. Next? Well, that would be Olds and their weaving program. Got the Letter of Intent yesterday. Now to hope there are sufficient students for my class to run. PS - I know some of you are wondering when the Big Reveal will happen. Officially it will be right after Convergence. Some of you have guessed what the Big Project is all about. This picture will give you another clue. The studio feels very empty now. The extra people are gone - or will be tomorrow - gone out of the studio, at least, along with all their equipment. The cold that jumped on my body two weeks ago left me drained of energy but I had recovered sufficiently by Monday night that I figured lots of chemicals would keep me functioning. 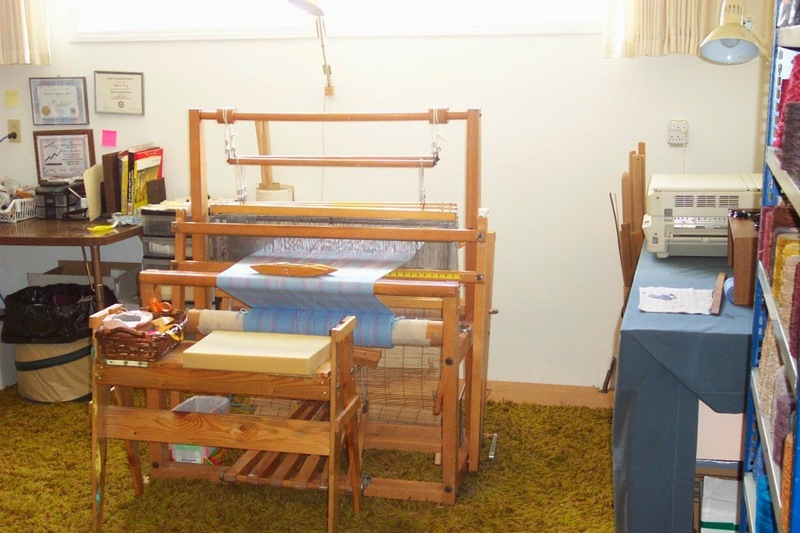 Right now I am looking forward to a couple of days of R&R - there are about 6 yards left on the AVL which I will pick away at, plus there is an 11 meter long place mat warp on the small loom I can work on as well. The forecast for weather this week was overcast and cool. Mother Nature decided to show off for my out of town guests and it was lovely spring weather. By the time we head out to the airport tomorrow morning the town will look significantly 'green'er than when they arrived. We did some sight seeing and from the university (on the hill overlooking the valley the town is situated in) we had a lovely view. 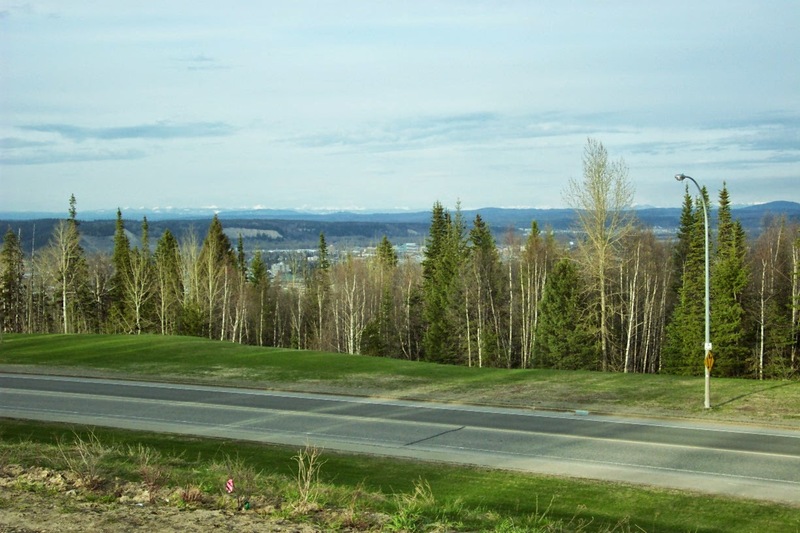 The white peaks of the distant mountains were clear and because the trees were not fully leafed out we had a pretty good view of the town below. My town isn't perfect, but it's home. The count down has begun. The deadline looms. One more sleep. And my cold is still well and enjoying itself in my lungs. Tomorrow will be here regardless of how healthy - or unhealthy - I am. Better living through chemistry will be the slogan of the week. I never worry too much about stage fright. A little adrenaline helps to focus the mind. Getting the butterflies to fly in formation is the name of the game. Ready or not, the Big Project begins tomorrow at 8 am! While I would love to have such a clean studio to work in, reality is that I doubt this will last much beyond next Friday! The clutter we removed from this end of the studio is just gone to live somewhere else, not dealt with in any final solution kind of way. 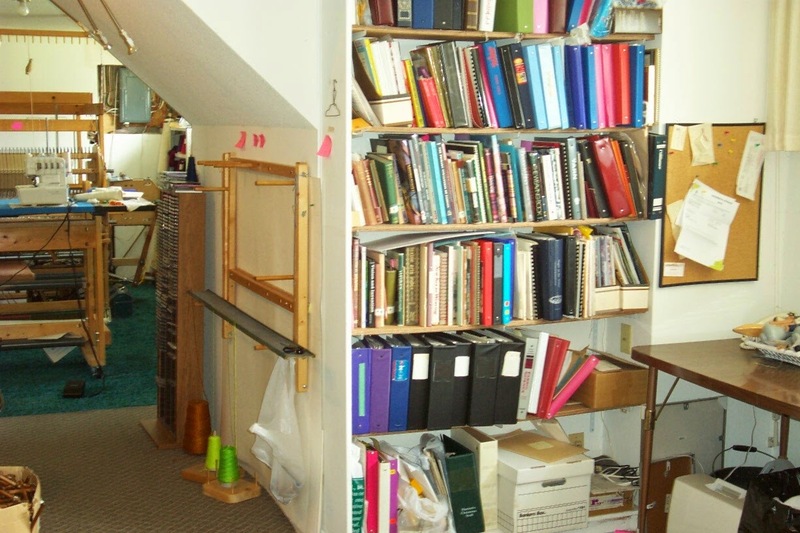 Much of the bins stored here are to do with bobbin lace and I'm not ready to get rid of any of that - yet. And so they will likely simply return and get stacked up in the corner again. 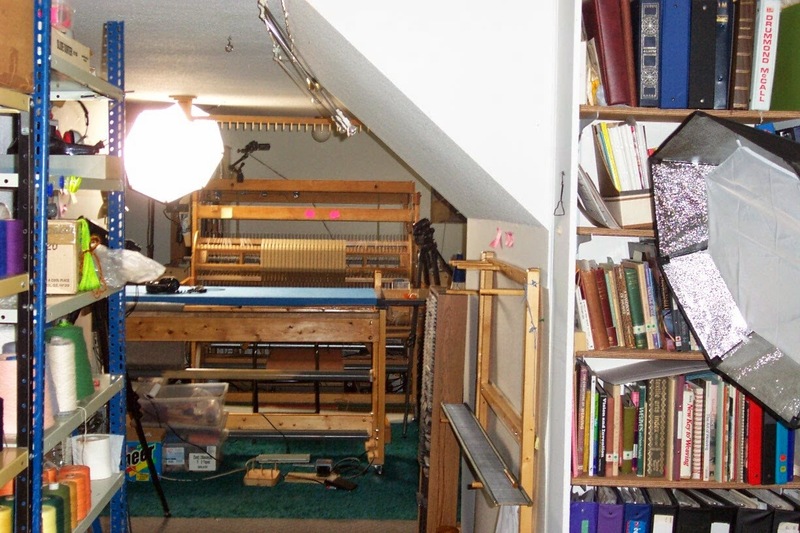 Not to mention the loom that usually lives in front of the dresser in the last photo. Currently on loan to a friend, it will likely come back at some point - unless I decide to sell it. 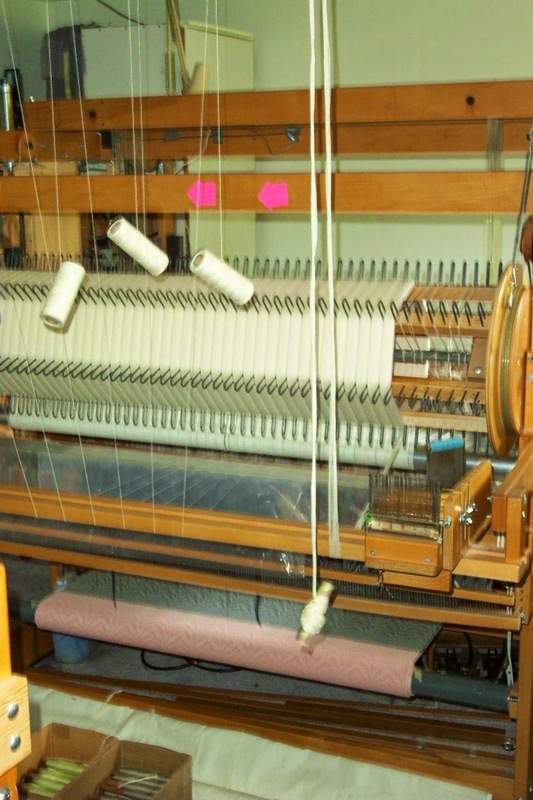 It's a 24 shaft Margaret (Woolhouse) lever loom and I bought it as a 'retirement' loom. Well, I'm not ready to 'retire' yet and it's been getting very little use for the past few years. I feel bad because it's a quite nice loom. 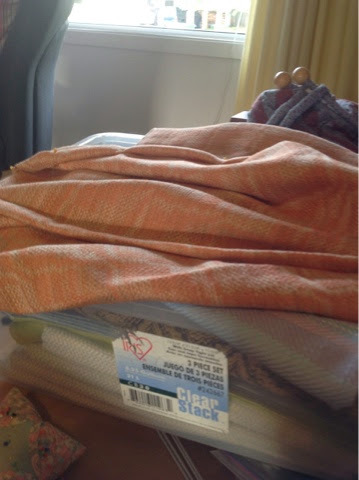 I've woven everything from 40/2 cotton to rayon chenille on it. But the cleaning up has served several purposes. There is now room enough (I hope) for the crew to move and do what they need to do. It is visually a lot more pleasing - less clutter to confuse the eye. Years of dust bunnies have been vanquished. 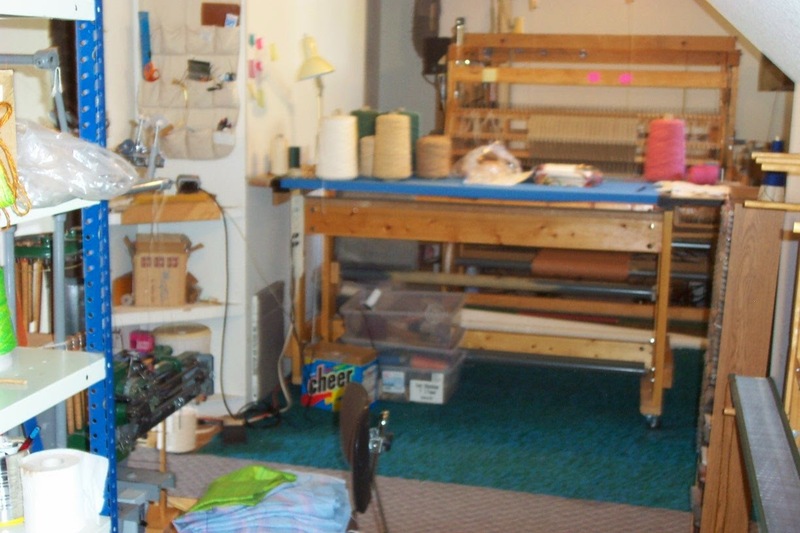 After helping to clear out two other weaver's studios last year, I can't help but feel as though I have at least made a start at dealing with some of my own mess. There is a great deal more to do, but at least I've had the pleasure of having a tidy space, even if only for a few days. I think I'm over the half way mark on this 30 yard warp. As soon as I finish the towel I'm in the middle of weaving, I'll cut off what I have woven and see how many towels are on the beam. And then I'll have a better idea of how much of this warp is left. There are a few more minor things to do to get ready for the Big Project next week, but I've been saving my energy for what little weaving I can manage. If nothing else, for the sake of whatever amount of endorphins I can generate. My cold isn't as horrible as what Doug has/had but it's taking my wind and my energy. But any forward progress is indeed, progress, so I am grateful I can still weave regardless. Progress on other fronts, too. I have a firm order from the designer and the weft yarns arrived yesterday. 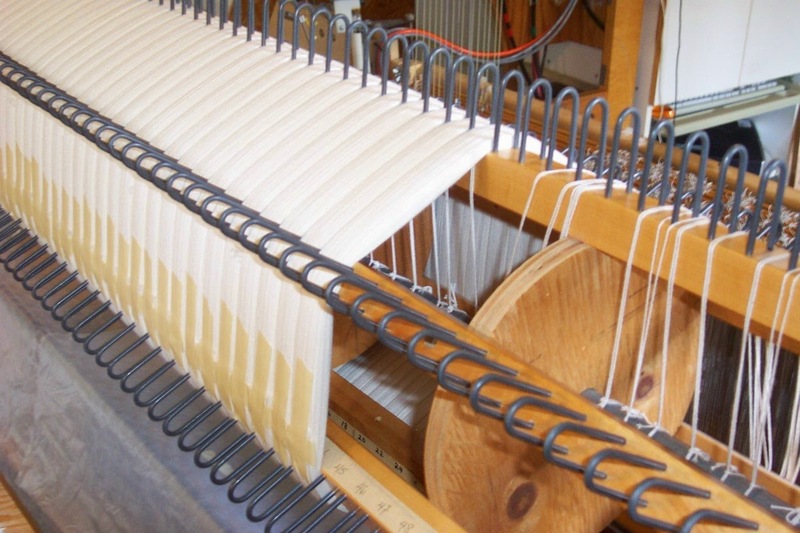 As soon as this warp comes off the loom, 50 yards of natural white will go on. I will weave some samples to make sure she likes the colours she's chosen and then - hopefully - I will be over this cold entirely and able to weave like the wind.